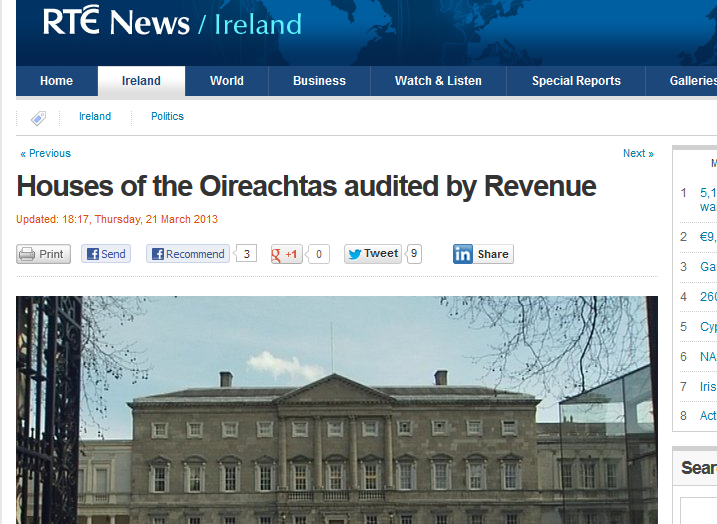 RTE News are reporting this evening that a Revenue are currently carrying out a tax audit on the Houses of the Oireachtas. This is the public body responsible for the payment of expense allowances to TDs and Senators. Travel and Accommodation Allowance. This is based on the distance to Leinster House from the Member’s home, and verified by Leinster House attendance records. The Oireachtas.ie website includes a wealth of information on both allowances and the claims made by each lucky recipient. It will be interesting to see what view Revenue take of the generous expense regime enjoyed by our TD’s and Senators. Revenue insist that unvouched expense payments to public- and private-sector employees and directors must in all cases be treated as taxable pay, although our leading politicians have traditionally appeared immune from such inconvenience. Is this about to change? a lot cash you will need the extra profitable you will be. single bedroom and two bathrooms.